Its been about a year and a half since Kindergarten Rainbow first opened its doors to 32 amazing children from the village of Tsaghkaber. The little ones have truly enjoyed their time, learning, playing, performing songs and dances for their parents, celebrating the holidays, going on field trips and more! You can check out their pictures below! Its hard to find words to describe the feeling you get when you see the work you've done achieve full realization. Nothing could have prepared me for what I would feel when seeing the children of Kindergarten Rainbow fully utilize everything we had worked so hard for. It was more than elation , more than fulfillment, more than gratification. All I can say is that everything was worth it. During the last day we spent in Armenia, Hasmik and I (Margarita) visited the kindergarten one last time. It was a Friday and by this time the kindergarten had been in operation for an entire week. Thirty two children from ages 4 to 5 were in attendance. We arrived at noon during their nap time. No description is suited enough to describe just how precious it was to see children napping in the room we spent so much time in--perfecting, beautifying, making it as comfortable and enjoyable as possible. As I strolled around the room taking pictures a few of the children awakened from the noises of my camera and soon their chitter-chatter awoke the rest of the children. One by one they opened their dewy eyes to a stranger in their already beloved napping room. A few of the children were brave and did not shy away from my camera. They began to tell me about their experiences in the past week. What they've learned, what games they've been playing, and how much they love attending the kindergarten. Their sleepy eyes sparkled as they told me about their favorite toys, how much they enjoyed the food and even nap time. After I helped them get dressed they assembled in the main room and began playing with Legos, a few recited poems that they learned, and others posed for pictures. Their teacher showed me their drawings, their Play Doh creations, and how she was utilizing the different teaching tools we purchased. She told me about the students' progress and how hard it was for some of the students to adjust to being away from home. Than she lead a group activity were the children counted, recited the colors and letters. As I continued to interact with the children Hasmik discussed administrative manners with the principle and other employees. They discussed things such as how they travel to the city of Vanadzor to retrieve supplies and food. How they cook and keep the spaces clean to meet all the requirements and what their daily schedule is like. It was evident that they were excited and driven to make the kindergarten an ideal place for the children to grow and to learn. Our trip culminated with meeting the parents who had come to pick up their children. They expressed their gratitude for the kindergarten and told us how productively they spent their newly found free time. This was amazing to hear because our plan for the kindergarten was not only for the children, it was also for the parents. We knew how hard it must be to lead a village life, and how much harder it becomes when your children do not have an enriching place to spend their childhood. These parents are now able to better take care of their everyday chores, and maybe spend a little time taking care of themselves. I am not sure how to end this post because a part of me realizes that this isn't the end for the kindergarten. We have bigger plans, we want to do more. There is still so much to provide to these children, to these villagers, that we cannot simply stop here. We will continue to do more. But for now we say goodbye to the children of Tsaghkaber and hope that we will have the opportunity to return again. A component of the Strauss Scholarship was getting media coverage for my project. I unfortunately was not very successful at doing this on my campus due to several major factors. However, with the help of my uncle, we were fortunate enough to appear on two morning talk shows—on Shat TV and Public Television of Armenia—and tell the people of Armenia and Armenians around the world about Operation Reconstructing the Future, the village of Tsaghkaber, and the Strauss Foundation. Here you can watch both interviews. Please watch from 27 minutes. By clicking on the picture below, you will be transported to H1 to watch the video. It is not very difficult to write a project proposal, in fact it is quite easy to imagine, estimate, make educated guesses, calculate and type out the perfect plan. However, sometimes, in the real world—especially when the ‘real world’ is 7,000 miles away from where the plan was written, and where people don’t function as efficiently as computers—things change. Things turn out differently from what you had planned, dates and objectives change, and what you have at the end is something quite different and perhaps more unexpectedly real and beautiful than what you had originally planned. The summer portion of Operation Reconstructing the Future, which was suppose to take at most of four weeks, involve myself, a group of students from the United States and Armenia, and the administrative body of the village of Tsaghkaber, transformed and expanded beyond any of our imaginations. To begin with, this project integrated and incorporated far more people than we could have ever hoped for. Members of my family became directly involved; namely my two uncles who dedicated an immense amount of their time and energy to helping me. Our wonderful friend and amazing film director, Robert Davidian became a essential part this project, as he documented our work and helped us along the way. A wonderful student group from Yerevan, called Breathing Walls, became a crucial component of the project when they helped us give life to the walls of the kindergarten. The members of the Lori Provence administration also participated in the realization of the project as they assisted with bureaucratic things such as, getting funding for the operation of the kindergarten and overseeing and supervising the kindergarten in my absence. Many of the villagers like my father’s college roommate, young school children, and numerous others who were truly interested in our work also partook in the Re-construction of their Future. Additionally the project lasted far longer than we had foreseen; instead of four weeks the project took two months. Furthermore, a much-anticipated portion of the project, the summer camp, was cancelled (or postponed until next year). Thus, this project, which lasted far longer than we had foreseen; changed beyond what we had imagined; and included the help of a very astonishing group of people, who came together from around the world and worked with one another with the aim of giving the village of Tsaghkaber a functioning kindergarten and with that a much brighter future. The Opening Ceremony, which marked the beginning of a new future for the village of Tsaghkaber and the conclusion to a summer of hard labor, personal growth, and adventure had finally arrived. On Thursday, August 28th I along with Mr. Santrosyan—the village mayor—cut the red ribbon and invited the children of Tsaghkaber into their new kindergarten. Hundreds of villagers joined us on this wonderful occasion. The rooms were filled with the chatter of the excited parents, the laughter of the happy children, words of gratitude, praise, and of course anticipation. It was extremely touching to see just how so many people gathered to celebrate the culmination of our work. The head attorney of the region of Lori, Alik Saakian, and the head of the department of culture, education and sport, Mher Melicyan also joined us in congratulating the residents of Tsaghkaber. Our hard work had finally paid off. The kindergarten was ready. The once empty walls were now filled with excitement and anticipation; anticipation for a new, brighter future; future filled education, empowerment, progress, and happiness. The ribbon cutting ceremony was followed by a celebratory dinner. Everyone was more than happy to toast to our accomplishments, our future projects, to our health and our happiness. We were particularly admired for our young age and our friend and teammate Indelisa Muro was exceptionally appreciated for the work she has done for Armenia even though she isn’t Armenian. The table was immersed in hope for a brighter future, stories of olden days, anecdotes about Armenian culture, and simple companionship. Our evening was concluded with a beautiful patriotic song preformed by Mher Melicyan, the head of the department of culture, education, and sport who also happens to be an exceptional opera singer. The song, Yeraz im Yerkir (My Country My Dream), which is dear to all Armenians made us feel more at home than we ever had and reaffirmed our purpose and motivation for our work. We left the village feeling extremely accomplished and with the determination of returning and continuing the work we had started. I think it's safe to say that up until this week none of us really understood the difficulty of the project we choose to bring to life. Throughout the past month and a half we had been working mostly outside of the village. A portion of our project was a weeklong summer camp, which I (Margarita), Hasmik, Astkhik and Indelisa were supposed to host. In this weeklong process our plans were to host the summer camp, help hire workers, register the kindergartners and have an opening ceremony. But things did not go as we had planned. Upon our arrival we discovered that much of the work that was supposed to be completed weeks ago was left undone and new problems began to emerge as the four of us became construction workers, plumbers, electricians, cleaning ladies and honorary villagers. Each day held its own set of obstacles that the four of us overcame through teamwork, our collective desire to succeed and the generous help of the villagers. We woke up everyday picked and cooked our breakfast and left to the kindergarten only to return late in the evening; at times as late as 2 am--yes 2 am because the furniture was delivered 10 hours later than the agreed upon time. We painted, we cleaned, helped run water pipes and plumbing and cleaned up over 10 buckets of water because our kitchen flooded. We made several trips to the Vanadzor and Spitak to purchase missing supplies. Spent hours scraping off old paint from windows, assembling furniture and installing kitchen appliances. Fresh problems seemed to arise every day frustrating us even further, but although slowly our work was moving forward. Our biggest obstacle the village mayor, Mr.Santrosyan, constantly frustrated us by refusing to complete administrative tasks but eventually although much slower than we had hoped for began to work with us. The regional government on the other hand was ecstatic to help us by allocating a budget for workers and food, and completing the necessary paperwork. The obstacles were difficult to overcome but we did. In the process we also had an amazing time. Our days were always brightened by the curious villages who walked in to see the work we are doing, especially the group of 3rd and 4th graders who came to the kindergarten to helps us every single day. They were an amazing group of boys who ran errands, brought us buckets of water and even bought us ice cream, not once but twice. Later we discovered that these children were recipients of gifts from Armenian Charity Club, a charity club my sister and I started in Ulysses S. Grant High School in 2009. Of course this fact made us further appreciate and value the work we were doing. This week was far more difficult than any of us imagined. But we were able to overcome every hurdle on the way, and left the village having completed our mission. We met amazing villagers like Samvel (the former village mayor) and Gegham (the engineer who ran our water pipes). These two men left their daily jobs in order to help us with our project. They not only helped but also encouraged us. They were physical and emotional support at a very difficult time. Like the rocky, muddy path that leads to the kindergarten this week was full of unexpected hurdles, but our steps had to be firm. We knew that nothing was worth more than the success of our project, which is why we were able to succeed. We left the village with the kindergarten completely furnished, a principle and accountant hired and ready for an opening ceremony. We had the most marvelous day working with the wonderful artists of Breathing Walls, painting and beautifying the interior of the kindergarten. We were accompanied by the wonderful activist and director Robert Davidian. He documented our work, got acquainted with the village, and was the most interesting and delightful companion for the way. The day was full of smiles, fun, laughter and of course hard work. From making friends, to dancing folk dances on the way, to bonding over sweets, and being covered in paint from head to toe this was an amazing experience for all of us. Currently one wall in each room is decorated with loving characters that will surely bring smiles to the faces of the children. The love and joy we painted into each character will soon be felt by the village children. Each new class will be able to learn in the company of these lovable characters and make our work that much more rewarding. We want to thank Breathing Walls for the amazing work they did for the Tsaghkaber kindergarten and the equally amazing work they do everywhere else. Our team consisted of Breathing Walls artists Andrey Grig, Nadia Hovhannisyan, Jasmin Gasparyan, and Susanna Hayrapetyan. Hidden Road Initiative members Margarita Baghdasaryan, Astkhik Hakobyan, Indelisa Muro, and Hasmik Baghdasaryan. And of course, the magnificent Robert Davidian. Upon our arrival in the village we received a warm welcome and words of gratitude from all the villagers, especially those with young children. The building, which will house the kindergarten, was in a moderate condition but definitely needed some serious renovations. Two spacious rooms in the left wing of the building will serve as a playroom and a bedroom. Additionally we are renovating a room, which will serve as a kitchen. A corridor where kids will change their coats and outside shoes and of course a restroom. Renovations are underway!!! Our builder is Armen Hunanyan, a local, born and raised in Tsaghkaber who has two kindergarten age boys. He has been working hard since July 20th to prepare the kindergarten for our week-long summer camp and for the school year. We will be working with an amazing nonprofit organizing, called Breathing Walls, composed of volunteer artist who travel and paint the walls of kindergartens, hospitals, and orphanages across Armenia. We are excited about the progress we are making and cannot wait till the doors of the kindergarten are officially opened sometime in mid-August. My sister and I, along with our team from the Hidden Road Initiative have been tirelessly working and preparing for our upcoming trip to Armenia. It is hard to believe that in less than a week we will begin working on Operation Reconstructing the Future. Our suitcases are mostly packed and ready to go. Filled with toys, educational puzzles, teaching material, hundreds of crayons and colored pencils, along with lots and lots of bug-replant and anti-itch cream, we are almost ready. The children of Tsaghkaber will soon have a fully functional and beautiful kindergarten to spend the most important first years of their lives. I know our efforts will have the most positive effects on the lives of the village children. I'm looking forward to blogging from Armenia. Tsaghkaber here we come! 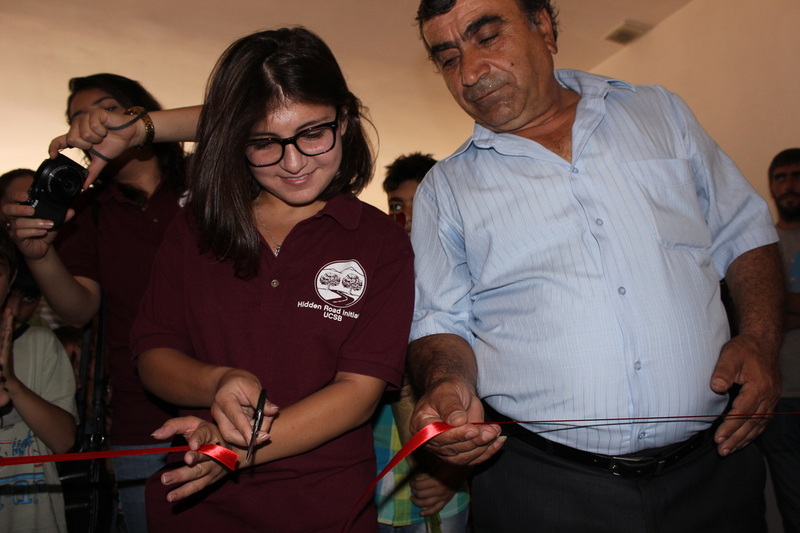 Operation Reconstructing the Future was founded by UCSB Student Hasmik Baghdasaryan in order to renovate, furnish, and launch a kindergarten in the village of Tsaghkaber to enhance the social capabilities of the village children. Through this endeavor she hopes to empower a new generation of students, support young families, and promote the economy and social equality of the village.